These berries and holly are so easy to make and look adorable for the holidays! * Last but not least, some Christmas spirit! Step 1: Take the red fondant and roll it into little balls. 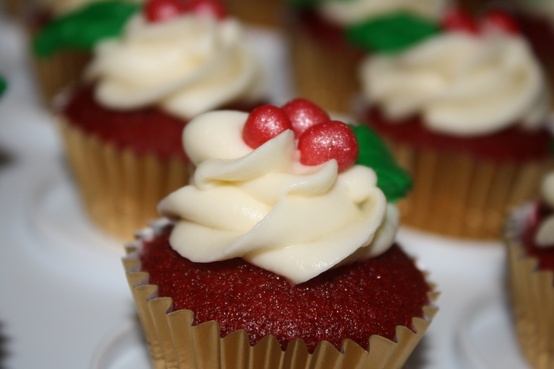 Depending on what size your cupcakes are you may want to make the berries smaller or larger. These berries here are for mini cupcakes. Step 2: Take the red shimmer and pour some into a small bowl. Step 3: Take the berries and place them into the bowl then move the bowl back and forth until all the berries are coated in pretty red shimmer! Step 1: Take the green fondant and place some into the leaf mold, once again depending on what size cupcakes your making you may want the holly bigger or smaller. The last step is to place 3 berries and 2 holly leaves on the delicious cupcake! Taa-Daa all done and it was so simple to make! Quick tip: Rather than buying a big tub of red and green fondant buy this pack at Michael's for only $10!